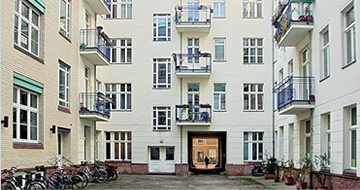 The building ensemble with three courtyards extends between Greifenhagener Straße and Schönhauser Allee. 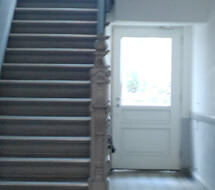 The quiet second court lying within is enclosed by a Wilhelminian building and a loft building. This location combines an excellent quality of living with ideal access to public transport and an optimum infrastructure in the direct vicinity. 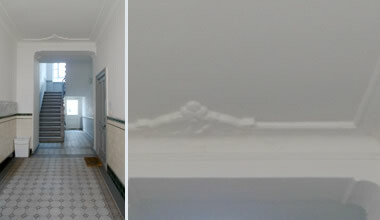 The old building received a newly converted top floor with 3 generously sized apartments, each with a roof terrace. Grandiose view over Berlin all inclusive. Find your dream apartment. Whether this is a modern loft or a period building with stucco, Gethsemane Höfe is the right address. 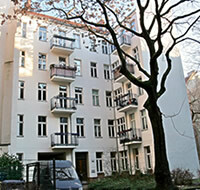 The generous apartments on the ground and upper stories were extensively modernised several years ago. Beautiful wooden flooring, high stuccoed ceilings, profiled wooden windows with modern insulated glazing and detailed wooden doors fully accentuate its historic charm. Most of the 60-100 m² sized apartments have a balcony, options for wood burning stoves and are accessed via an attractive stairway or lift. 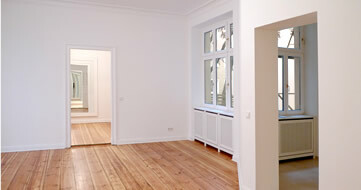 The existing wooden floorboards are professionally restored and equipped with matching transitions and skirting boards. 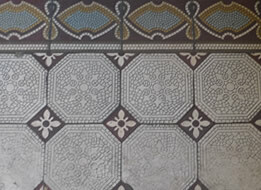 Bathrooms and kitchens have tiled flooring. The walls may in accordance with the purchaser's wishes be wallpapered or receive a plaster finish. The loft apartments have a generous and practical layout. Purchasers have the option to coordinate in structuring of the apartment, where structurally possible. Electricity and media supply correspond to modern standards. The bathrooms in the loft apartments have stylish functional fittings and faucets as well as modern mosaic tiling. A tasteful fitted kitchen and high quality branded kitchen appliances provide the optimum finish to the kitchen. The façades and enclosed outdoor area are currently undergoing full modernisation or re-design. The front courtyard includes in addition to access ways, green areas planted with trees and bushes and is to be further embellished. In the back courtyard is a children's' play area and bicycle parking. The atrium has been redesigned through light, selected materials and decorative plants to a stylish entree. The mostly preserved and carefully restored staircase shows many original details, from the banisters to the mosaic floor. We shall be very pleased to advise and assist the purchasers of the apartments on the ground and upper floors on any renovation or professional restoration of original details upon request. The period building was erected in 1906 and has been preserved almost without damage. In contrast, the buildings of the 1st and 3rd courtyards were almost completely destroyed during the war and were rebuilt in 1996.